Two border crossing tracks are for hikers, cyclists and also for cross-country skiers. They are connected to the network of the Czech-German border tracks. Both tracks state the route in Boží Dar, head towards Na Vraky, and head back from Boží Dar border crossing. The Lukáš Bauer Tour is named after a great cross-country skier, Lukáš Bauer. He won the 2006 Olympics silver medal, the 2008 World Cup and two bronze medals at the 2010 Olympic in Vancouver. The tour starts and ends in Boží Dar and it is 7, 5 km long. Lukáš Bauer and his great achievements in cross-country skiing are inherently related to the Ore Mountains where he trains and lives with his family. Lukáš Bauer Tour runs from Boží Dar towards Na Vraky and comes back across the border crossing Boží Dar/Oberwiesenthal. 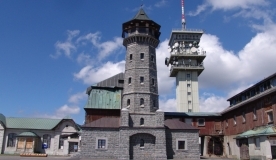 This tour is 24,5 km long and it is named after legendary Olympic ski jumper, Jens Weissflog, whose life is associated with the German town, Kurort Oberwiesenthal. Young Jens attended a school in Kurort Oberwiesenthal and trained on a local ski jump. Nowadays, he owns a hotel in Oberwiesenthal. Jens Weissflog Tour runs from Boží Dar towards Na Vraky and comes back across the border crossing Boží Dar/Oberwiesenthal. You can get the latest information about the condition of the mountain tracks and more useful tips at the Tourist Office Boží Dar. You can also purchase maps and many useful cycling tools there.